Recommended for: Someone who wants a gumbo of mystery, lit, pulp, and African-American experience. I came to Colson Whitehead by way of zombies. Colson Whitehead, writer of award-nominated books, including National Book Critics Circle, the Los Angeles Times Fiction Award, the Pulitzer Prize, and New York Times Notable Book of the Year; contributer to the New York Times, The New Yorker, New York Magazine, and Harper’s; and recipient of a MacArthur Fellowship. Yes, that Colson Whitehead. Zombies. I’d like to pause for a moment and just admire the mind-twist for those that deride zombie books. The writing in Zone One (my review) was astonishing enough that I resolved to seek out more of his work. The message was bleak enough that I wasn’t in a hurry about it. Though I picked up John Henry Days some time ago for a song, it was finding The Intuitionist that brought me back to him–I find a little mystery hard to resist. Except it wasn’t, not really. Allegory and all that. Post-modern literature something-something. Except better, because it’s not self-consciously ironic or a parody. It’s sincere. On the surface, it’s a pulpy noir fiction, set in a roughly parallel world to ours, ugly racism warts and all, in an unnamed New York, during perhaps the 1940s. It’s about a woman who works as an elevator inspector, a member of the prominent and politically powerful Department of Elevator Inspectors. The elevator doctrine has undergone a schismatic shift in the past decade, after Mr. James Fulton developed the theory of Intuition, the discipline of inspecting an elevator by analyzing one’s experience of it. Lila Mae is the first colored woman in the department, only the second colored person in the local chapter, and a disciple of Intuitionism. When a brand new elevator crashes (thankfully, without passengers), it seems she and the Intuitionists are being set up to take the fall and enable an easy political win for the Empiricists. Lila, unsure how to defend herself, takes a role in solving the issue after the head of the Intuitionists approaches her with a tempting lure–designs for Fulton’s mythical black box seems to be in play but missing, a Holy Grail of elevator design that will revolutionize the city. In one sense it works. The surface plot is interesting–there are, after all, secret societies, company cars, a muck-raking newspaperman, gangsters and potential lovers. The story holds, Lila Mae is sufficiently developed beyond allegory, the city is full of rich detail, the puzzle of the elevator guild interesting and the possible blueprint alluring. Weaving through it is Lila’s acknowledgement of the experience of being an African-American woman, her history, and her gradual awakening in the city. In another sense, it feels very constructed, very designed, meant to educate and explore, and not quite so much to feel. The Intuitionist is Whitehead’s first published work. I was a little disappointed to not see the same level of prose that I loved in Zone One. Bleak as it was, the imagery in Zone was mesmerizing and intricate. In contrast, this is a book not necessarily of language, but of ideas. Elevators have, in essence, transformed the city, allowing it to reach new heights. A new elevator–the fabled black box–would do the same. 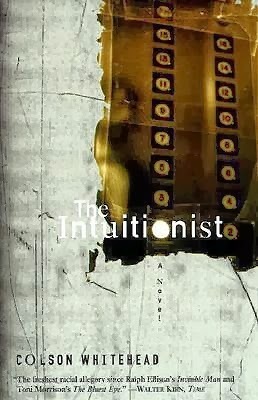 Intuitionists are transforming the field, and people of color are transforming themselves. 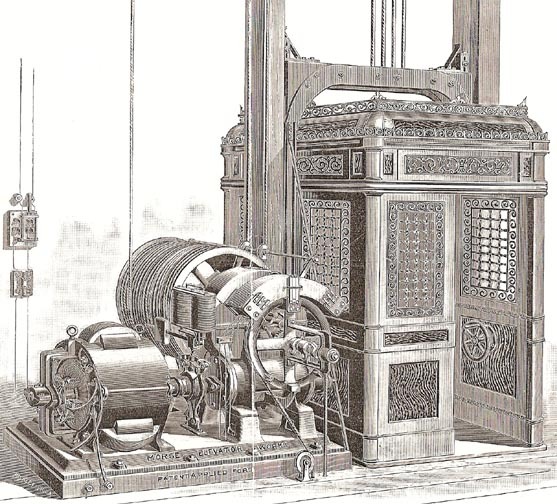 It’s fascinating and complex, and much like an elevator–gears, weights, counterweights, artistry, and while the purpose is clear, the mechanism of the parallels are not so obvious that the reader feels overpowered. Unfortunately, it also, much like the elevator, misses the feel factor. I enjoyed it as a read, I was intellectually engaged, but it reminded me a bit of high school English class, without the note-passing (we didn’t have texting in those days). Perhaps it’s because Lila Mae is somewhat disenfranchised from herself–as she goes through her life one step removed, I found I remained somewhat removed as well. Still, it was interesting, and pleasantly complex. I don’t regret the time spent, and feel rather pleased about exercising those mental muscles. It definitely piques my interest in the rest of the Whitehead cannon. Three and a half stars, rounding up because this author can write.